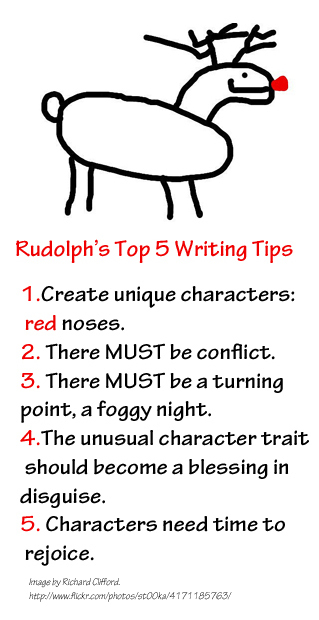 Just got an e-newsletter from the North Pole and Santa passed along these writing tips from the Frosty the Snowman, posted for the young-at-heart who are writing novels this year. Back by popular demand is my series on writing tips from popular Christmas figures. First published in 2007, they are updated here for your Christmas cheer. Unique characters. Give characters a tag, a physical or emotional something that makes them stand out from the crowd. That red nose, in the context of a reindeer herd, is absolutely astoundnig. Conflict. The conflict here is the usual playground teasing and bullying of someone who is different. It’s a classic theme because we can all identify with it on some level. Don’t’ be afraid of classic themes; just use them in unique ways. Also, pile on the conflict. The other reindeer do three things to Rudolph, each an escalation: laugh, call him names, exclude him from games. Turning point. After the set up and the conflict, comes the turning point. The crisis here is that Santa must deliver the toys to the children around the world, but the weather isn’t cooperating. The unusual characteristic becomes a blessing. Again, this is a cliched way of handling a conflict and crisis, but it still works. The very thing that sets the character apart, that makes him/her different and weak, is also the very thing that makes the hero able to save the day. Of course, this means we are matching up conflict and resolution, too. Santa also functions as a sort of mentor here, one who is able to recognize the unique qualities of Rudolph for what they are. Rejoice. It’s not just the climax here, but also the concept of a celebration of successfully completing a quest. Give characters a moment to celebrate. This often comes after a big battle, or a big effort to overcome something. And, of course, you must end with the famous cowboy Gene Autry, singing Rudolph, the Red Nosed Reindeer in 1953. His original recording hit the top of the charts in 1950. Think the story is still a little slight for todays’ market? Here’s why. I usually do recommend watching out for “Then all the reindeer loved him” endings. Ann:Thanks! These were great fun to write. Thanks, Darcy. This analogy makes the formula easy to follow. I must agree with Kristin, though, about happy endings. Some of the most enduring and thought-provoking stories are those that involve a tragedy near the end. Thanks for adding to the discussion, Kathy. I like what Katherine Patterson said; paraphrasing, she may not always in in the situation resolved, but she likes to leave young readers with hope.